Hakusan, Japan, February 25, 2014 – EIZO Corporation (TSE: 6737) announced the release of the DuraVision FDF2304W-IP, a 23-inch IP monitor for security and surveillance environments. The DuraVision FDF2304W-IP connects to up to sixteen separate IP cameras* via LAN cable for efficient video monitoring without the need for a PC. The monitor provides users with five different video layout options for a viewing video feed from a single camera at full screen, or up to sixteen videos on the same screen simultaneously. Users can also set the monitor for sequential switching for up to four connected video feeds. The included remote control allows live adjustment of camera settings for flexible control such as camera brightness, focus, zoom, pan, and tilt. Day and Night preset modes in the monitor are optimized for viewing images under different environmental conditions throughout the day. Users can switch between modes at the touch of a button with the included remote control. The monitor offers superb image quality in full high definition for surveillance applications where moving pictures need to be displayed clearly for precise observation. The non-glare IPS panel has a wide viewing angle of 178° that exhibits minimal color shift, making the screen easier to view from any position. The panel is also non-glare so reflective light is dissipated for a highly visible screen. The FDF2304W-IP reproduces smooth images by converting an 8-bit signal to 10 bits within the monitor and selecting the optimum color values from a 10-bit lookup table (LUT). The optimized data is then converted back to an 8-bit output signal, resulting in smoother gradations. The LED backlight has a wide dimming range that is adjustable to as low as 3 cd/m2. This makes it more comfortable to use the monitor in dim or changing ambient lighting conditions. The monitor also utilizes a hybrid solution to regulate brightness for flicker-free images. This greatly reduces eye fatigue when viewing the screen for extended periods of time. 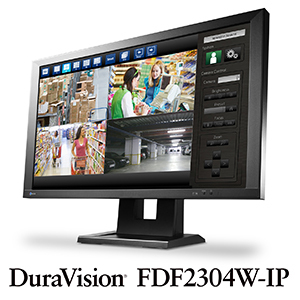 The DuraVision FDF2304W-IP will be available from the end of May, 2014. Please contact the EIZO subsidiary or distributor in your country for details. *Please visit eizo.com for camera compatibility information.